Neighborhood Friends Activity Jumper is rated 3.7 out of 5 by 48. 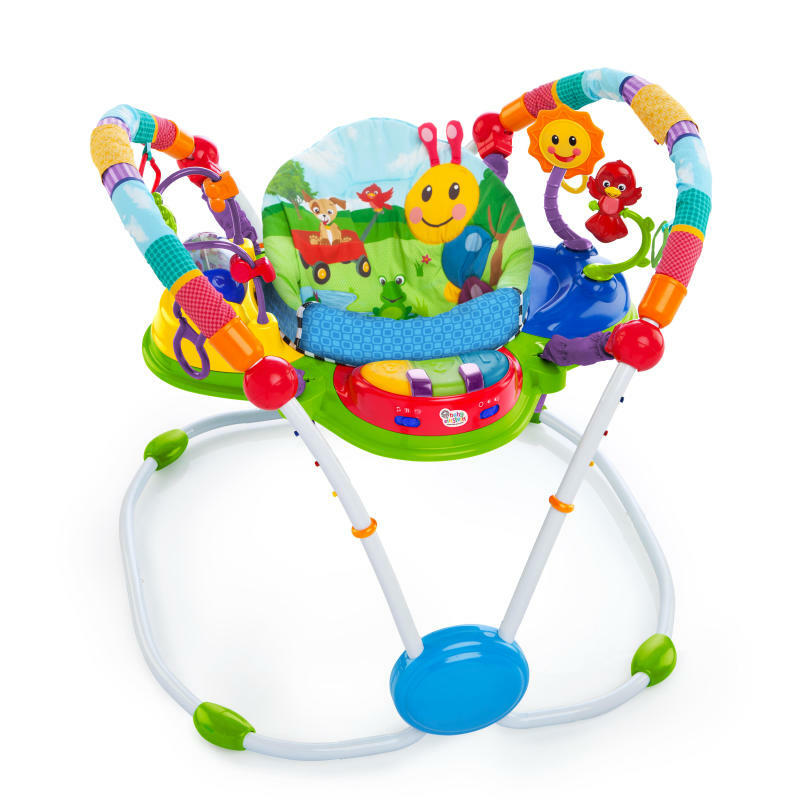 The Baby Einstein Neighborhood Friends Activity Jumper will captivate your baby like no other activity jumper can. With 360 degrees of multi-sensory activities, your baby can swivel and play every which way. The activity center features 3 play stations and more than 12 activities to explore. The light-up piano lets your baby compose their first musical masterpiece, while the spinning frog bead chaser encourages hand-eye coordination. With extra link loops, you can add your baby’s favorite toys or swap out new playful friends so entertainment is always in reach. The baby bounce chair allows your little one to jump and dance, which helps strengthen their developing leg muscles. With no doorways required, you can watch your baby safely play and grow wherever you need to be. From music appreciation to language introduction, this award-winning Baby Einstein jumper turns the idea of a baby bouncer into an imaginative world of discovery. Dimension (in) 30.5" x 33" x 29"
Born from the belief that the future belongs to the curious, Baby Einstein™ helps parents cultivate curiosity - within their children and themselves - through experiences of shared discovery and creativity. Why? Because curiosity motivates us to learn and adapt. It compels us to be open to possibility and confident in our skills. Curiosity is essential for succeeding in our ever-changing world and creating a better one. Rated 5 out of 5 by GrandpaD from Fun for the Babies! Our young Grandson LOVES this jumper. It keeps him occupied and happy for hours. Thanks!! Rated 4 out of 5 by Anhngo from Good ideas but there are flaws We bought this when our baby was 6mos (she is now 10mos). She loved it until the music piano broke. It was like two months after we purchased it. Rated 5 out of 5 by Bumbyrumby from Long lasting & very sturdy. My baby is 10+ months old in the picture and we have had this since he was allowed to use it, he’s used it the entire time & continues to use it enjoyed it greatly. I like the fact you can add your own ring toys. Very sturdy, this gets lugged around my living room at least several times a day. Rated 5 out of 5 by Bumbyrumby from Long lasting & very sturdy. My baby is 10+ months old in the picture and we have had this since he was allowed to use it, he's used it the entire time & continues to use it enjoyed it greatly. I like the fact you can add your own ring toys. Very sturdy, this gets lugged around my living room at least several times a day. Rated 3 out of 5 by IAFtm from One problem... I would have LOVED this, except I accidentally mounted the spinning frog on backwards and now it juts straight into my baby's face. It was a tired mom mistake, but I thought I could fix it by just taking the frog out and flipping it around. However, the toy doesnt come out once in place!! It is my babys favorite toy on the whole thing (go figure!) But I have to take it out because it's just way too close to him now. Would be a great product if I had a way to fix this!! Rated 1 out of 5 by brooklyn from seat doesn't spin i purchased this thinking my baby could spin 360 around but it's so stiff there's no way he can on his own. took one back for an exchange, only to find out the replacement is the exact same way. this was $130 CAD product so im not impressed. Rated 3 out of 5 by AnnieE from Not as Durable as Old Model We had an older version with our first two kids - if lasted forever and was still in great shape so we passed it on to our friends. When our littlest came along, we bought her this newer model and she has loved it - except at 7 months she was able to break the sun right off the base where it clicks in. Very disappointed it didn’t even last 3 months for us.